Hei, olen aloittanut jälleen kerran uuden blogin kirjoittamisen ja tällä kertaa aion jatkaa kirjoittamista suomeksi. Käy katsomassa uudet sivuni osoitteessa www.kaskimaankeittiössä.com. Sieltä löydät reseptin esimerkiksi näihin ihaniin kotikutoisiin viinereihin! Coffee, cake or a drink? Why not just have them all?! I love coffee and my dear hubby just loveslovesloooves whiskey. And you know what, we both really loved this cake. I´m slowly trying to get my taste buds around the golden wonder that they call whiskey. As I´m not quite at the oh-I-feel-like-a-glass-of-whiskey-every-once-in-a-while -mode, yet I just have to think of other ways of consuming it. Form cake: not too bad a choice. Normally, I get my ideas for recipes from one or two ingredients. Sometimes, they start building up through some sort of visions or images. You know, when you imagine eating something at some specific moment. The vision for this cake came through a comfy-treat-yourself -picture. I wanted to make this flavor-rich indulgence for moments when you just want to curl up in your Chair (not a, but the), read a book, have a nice drink and then, eat a big piece of cake. This cake almost shouts these kinds of moments. In it´s spiciness and comfiness I quess this cake is also pretty Christmassy. I bet if you whip up something like this as a present for your dad or granddad, they´ll be very pleased. 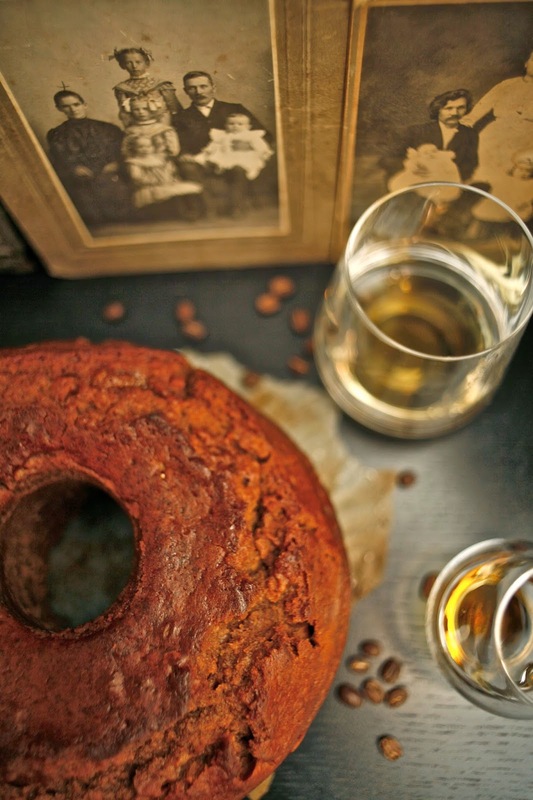 Just remember to tell the it´s a WHISKEY cake - very fancy and manly. Mix all the dry ingredients together. Mix sugar and butter together and whip until the mixture is white and creamy. Keep whipping and the eggs one by one and after add the liquids and the dry ingredients into the mixture by turns. Whip the mixture smooth. Pour into a cake mold (if not silicone rub some butter to the sides so the cake won´t stick). Bake in 160°C oven for about 1 hour. Check towards the end if cake is ready by sticking a wooden stick in the middle of the cake. If it comes out without any batter on it, the cake is ready. Let cool down. 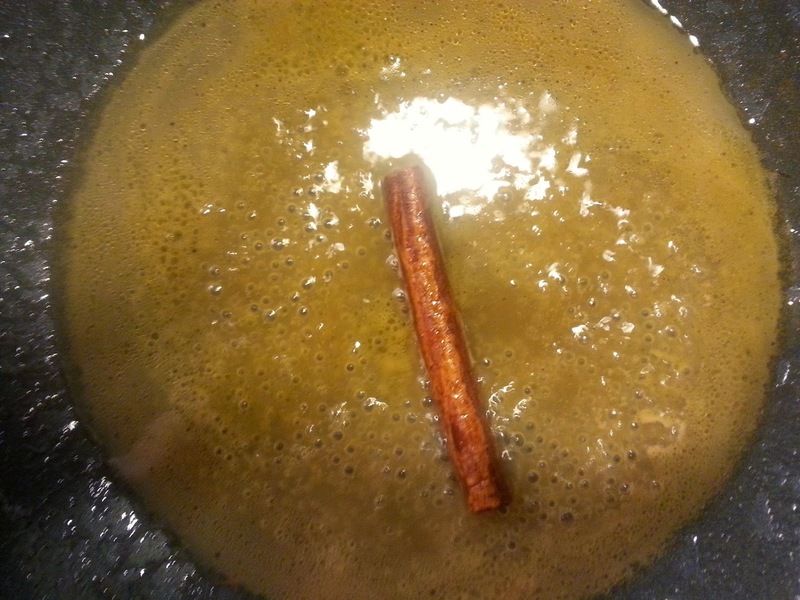 Add the sugar and the water into a pan and boil until the mixture is a bit syrupy. Add the whiskey. Moist the cake with syrup and cover with cling film. Let the cake chill out for a day or two. Whip the cream and add in all other ingredients. Mix well. Add the cream on top of the cake just before serving. Decorate with coffee beans and dark chocolate. If you put together pear and pear liqueur, what do you get? A really freaking tasty couple of pears I say! Christmas is here soon and that means I have a million ideas for Christmas table already. This dessert is one of them. 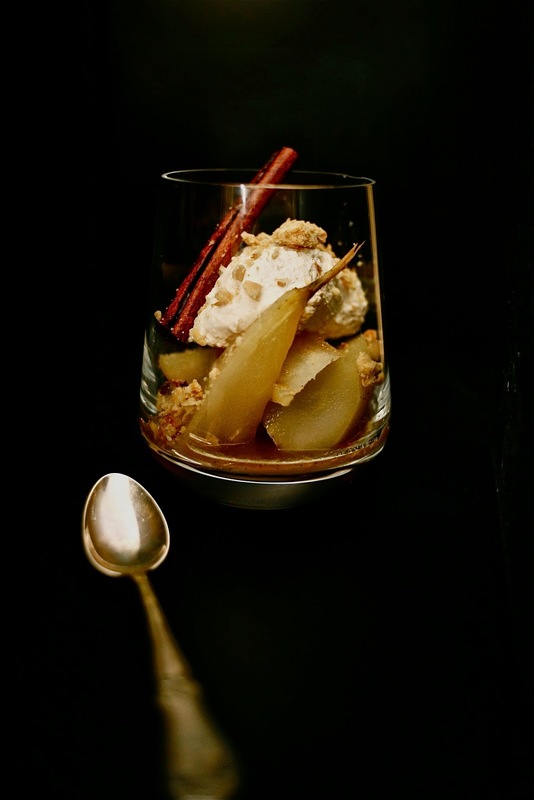 I guess port wine poached pears is a pretty classic combination but I wanted to marry my pears with pear liqueur Xanté. It´s probably because I happened to have a bottle of it in my liqueur shelf but also, I really wanted the pears to maintain their fair color. I colored the mascarpone cream with golden food color to make this dessert a bit more festive but the color I used didn´t work that well (it just made the cream look yellowy). But do try the coloring, it´s a nice little touch for this fine dessert. We tried this with Jani today and I must say that this totally works for other occasions than Christmas, too. Peel the pears and cut them into quarters. Take off seeds if there´s any. Melt the butter in a pan and let it brown a bit. Add the pears and sugar. 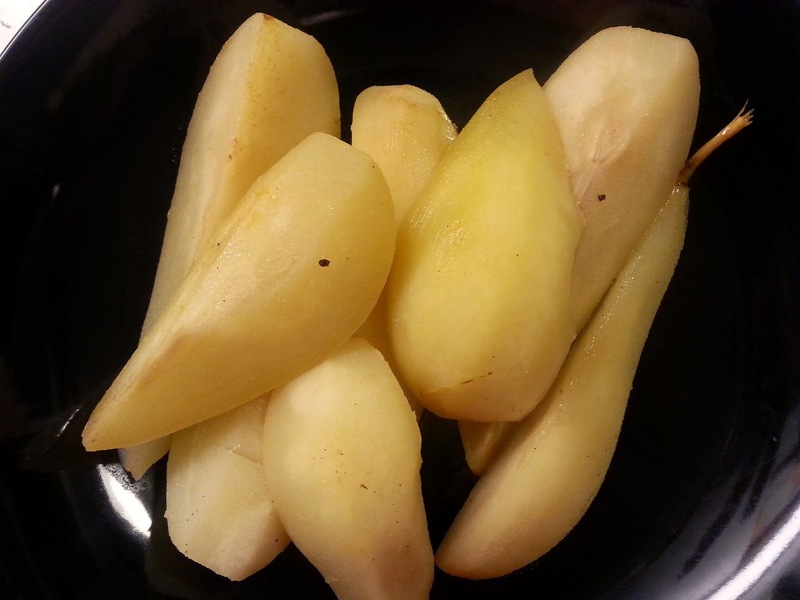 Flip the pears a few times in the pan before adding Xanté, apple juice, cinnamon stick, lemon zest and halfed vanilla pod. Let the pears poach for about 15-20 minutes. Flip at least once during poaching. Take the pears out and let the liquid caramelize a while longer. It´s supposed to get syrupy. Add a few drops of lemon juice at the end. Whip the cream and add mascarpone, lemon zest, food color and sugar and mix. Put the mix into the fridge unless you put the dessert together immediately. You can do this mascarpone cream and the crumble before-hand and then put the dessert together when it´s time for it. So you won´t waste any time if you´re having dinner with others. Mix all the ingredients with your fingers until the mix resembles wet sand. 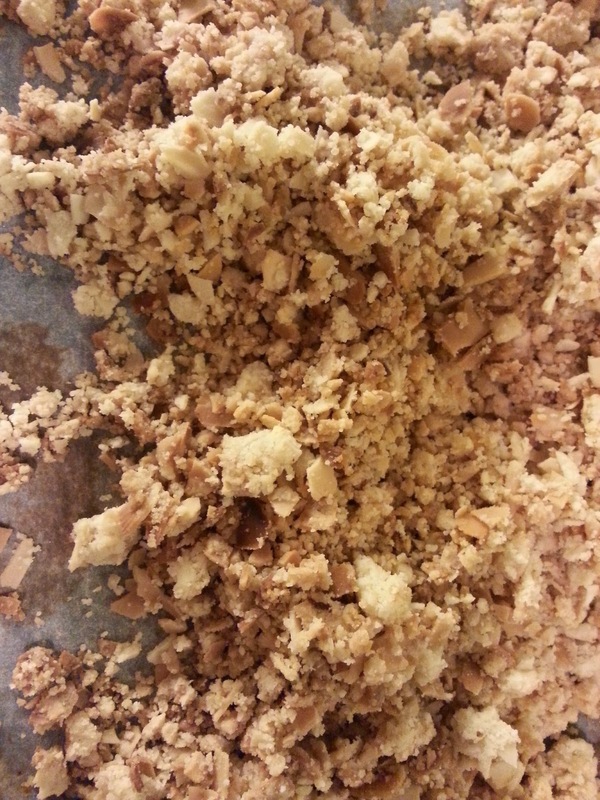 Don´t over-work the dough otherwise it will start forming gluten and we don´t want this as the crumble is supposed to be.. well, crumbly. Pop in to the oven into 160 °C for 5 minutes or until the mix is golden brown. 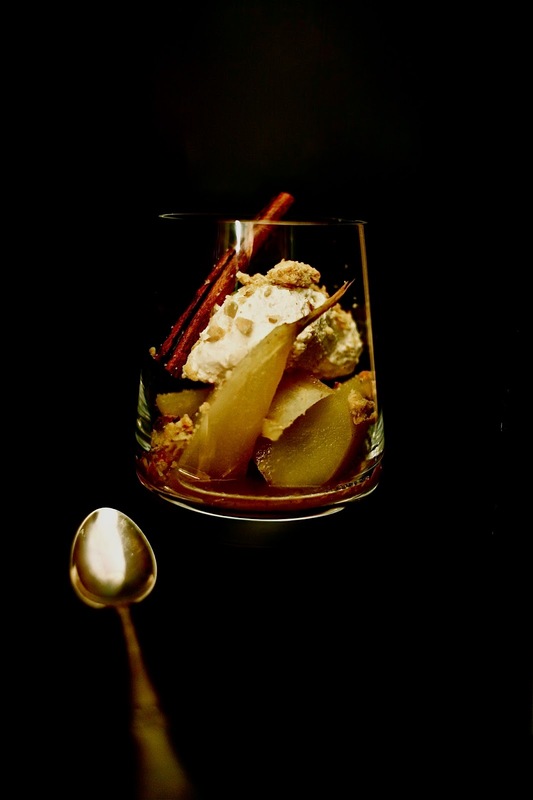 Put the quartered pears to the bottom of a clear glass. Pour some syrup on top. Add the mascarpone cream on top and top it all up with the crumble. Decorate with a whole cinnamon stick. 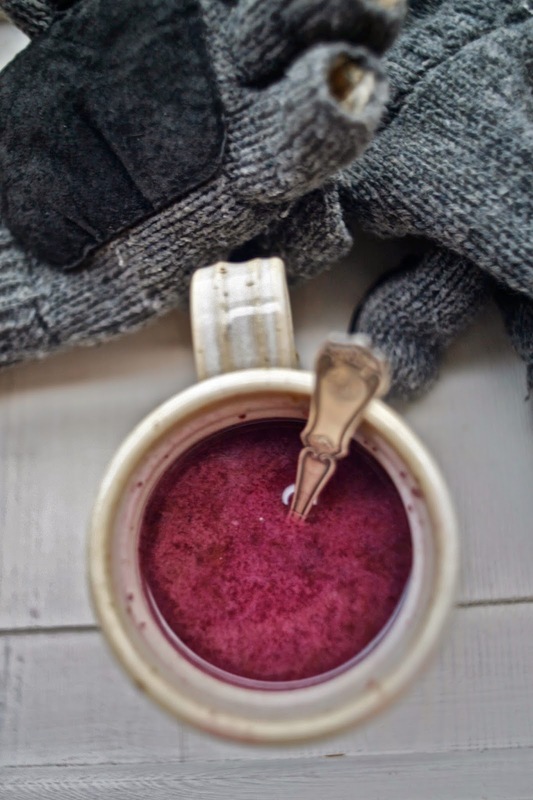 Imagine having a chai latte but instead of tea you´d be sipping heart-warming blueberry milk. When we were kids we used to go picking blueberries and wild strawberries in our summer cottage. When we´d get back to the cottage we´d put the berries into a mug and pour some milk on top of them. After drinking our berry milks we all had our mouths and teeth covered with blueberry. What a sweet and hilarious mess it was! This, dear readers, is a taste of summer and memories for me. 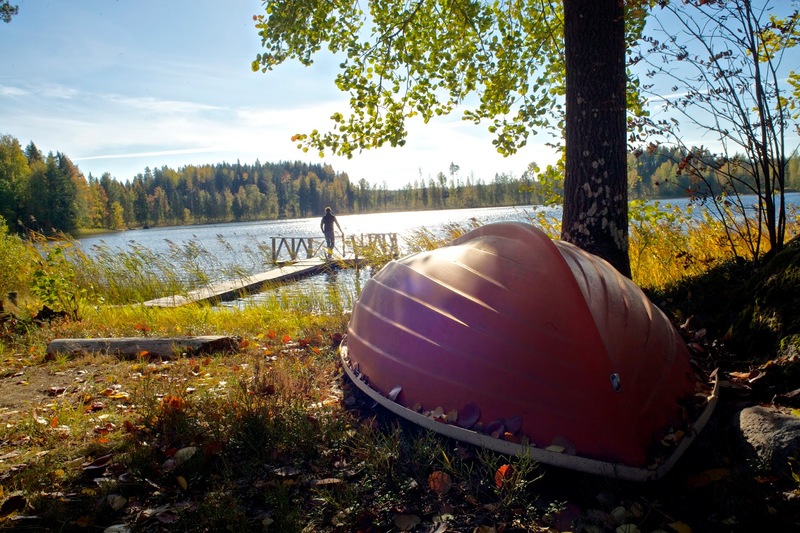 End of the summer in our childhood summer cottage. And this is the time I really want to re-live those moments. Now it is probably the gloomiest time in Finland: it´s dark almost round the clock, the nature is colorless and we don´t have the snow on the ground yet (we did but it melted away). So, there really is a call for a nice memory and warmth of summer right now. This blueberry drink has it all: the taste of childhood, the sweetness of blueberry pie and the warmth of summer. All in one cup! 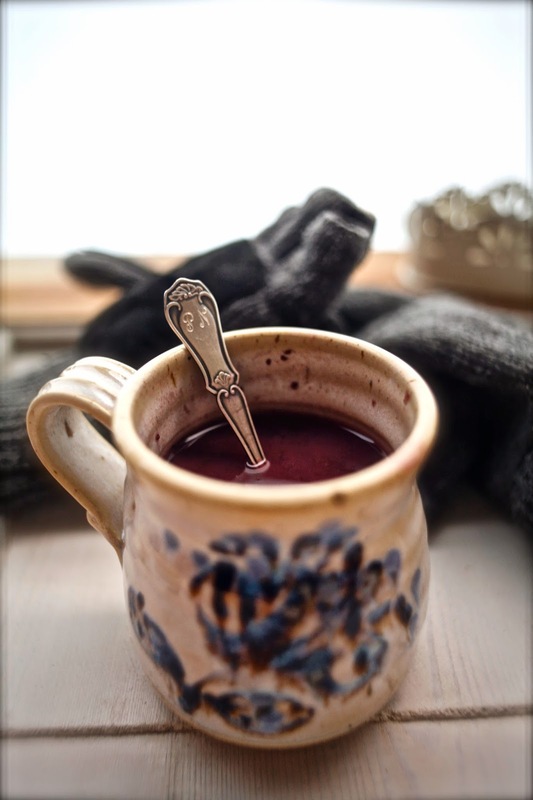 When you´re having this cuppa I promise you, there will be a glimpse of summer light in your heart for a moment. Share it with your friends or enjoy it alone – as long as you brace the magic of tastes and memories you get whilst sipping away this blueberry dream. Cut the vanilla pod half and carve all the tasty vanilla seeds into a pan. Add all the other ingredients. Bring to boil. Boil in low temperature until there´s only about 2-3 dl liquid left (about one hour) and the texture is syrupy. Put through a sieve and preserve in clean jar or a bottle. Mix 4-8 cl (how ever sweet you like it) of blueberry syrup with 3 dl warm milk. This bread - simply awesome. Everyone who knows me and has read my blog knows that I love bread and especially, the bread dough. 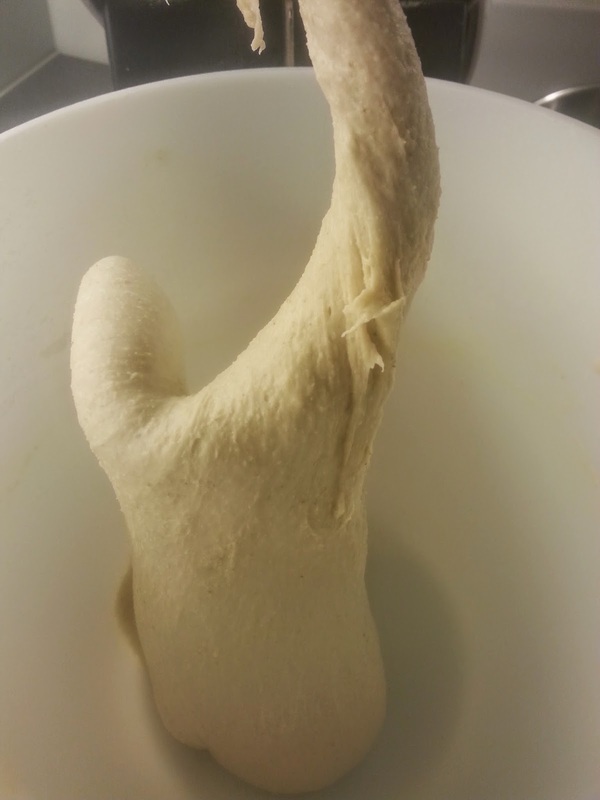 There´s nothing more satisfying for me than sinking my fingers into a perfect bread dough, mmmm! Even the thought of it gives me goose bumps. Not only do I love bread and dough but I also happen to love beer. A lot. So, I´ve just tried to invent as many things as possible I can use it for. Beer gives bread an amazing taste. 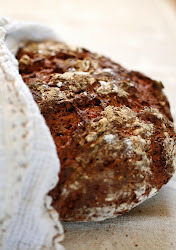 I´ve used beer also for example in my oat- and malt breads (which I will translate for you soon) and they are oh-so-yummy, too. I normally buy non-alcoholic beer for baking for two reasons: 1) it´s cheaper 2) this way I make sure I won´t drink it before I start baking things! :D The normal beer works just as well in baking as long as you´re willing to give up your refreshing beverage for a good cause. This bread is very easy to make. It takes a while for the dough to rest and develop gluten but do give it time! The more patience you have with bread (and bun) dough, the better the result will be. But the actual work part is basically just mixing things in a bowl with a lot of love - very easy. Mix the ingredients in a bowl. Pop a cloth on top and let the dough rest for 1-2 hrs. 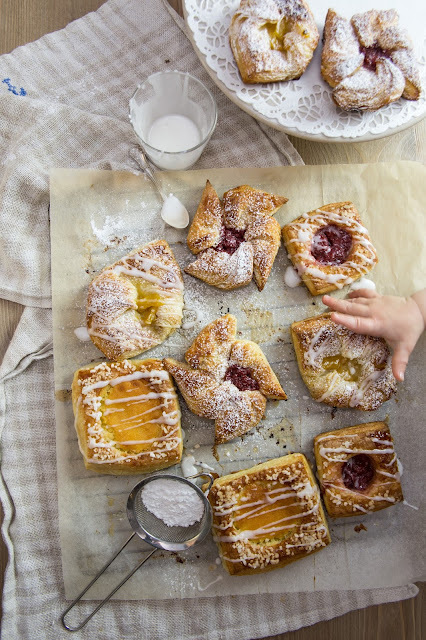 Note: we only have normal wheat flour in Finland. This means we don´t have self-rising flour so, I always mean NON-self-rising flour when I talk about wheat. I use “half hard” flour in my baking. In bread-baking this means that the gluten forms pretty easily in the dough and the bread holds it´s form nicely. Add the ingredients into the (hopefully bubbling) dough. Put the dough into a food mixer that has a dough hook attached to it. If you don´t have a food mixed you´ll have to knead the dough by hand. If you make a lot of bread invest in food mixer, it´s a life-saver and totally worth every penny. Let the bread rest about 20 minutes in the bowl and then knead it by hands against floured surface. 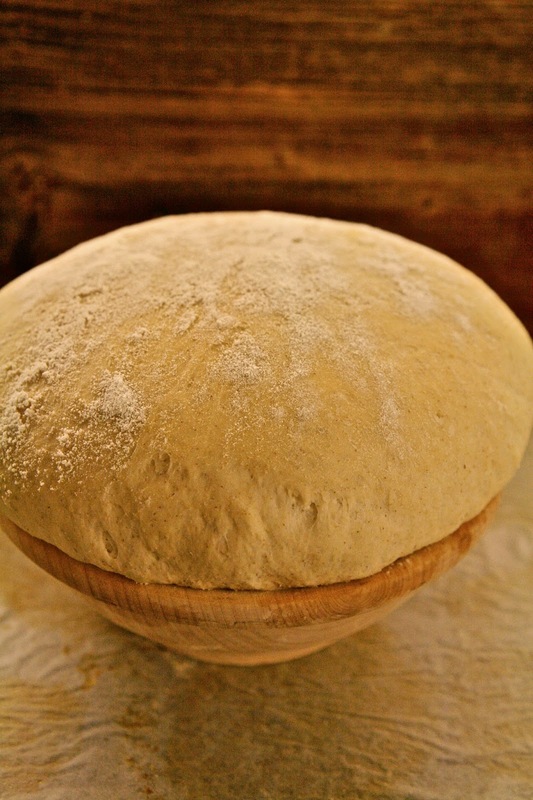 Put the bread into a floured “rise-bowl”(see below). Cover the bread with a cloth and let it rise for 1-2 hrs. Mix the butter and honey together. Put some baking paper on baking tray and put the bread on the tray. Re-shape the bread if it looks like it´s loosing it´s bready form. Bake the bread for 15 minutes in 200°C. Take the bread out and brush it with the honey-butter mix. Sprinkle the seeds and salt on top and bake for another 15-20 minutes. You can check if the bread is ready by knocking the bottom of the bread. If you hear a hollow sound, the bread is ready to go. Have a beerful weekend everybody! 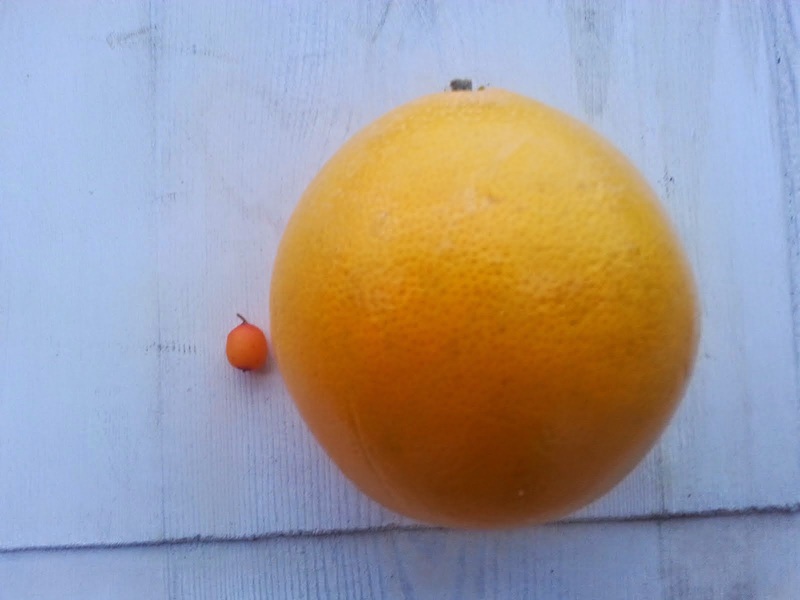 What is this tiny Finnish superfood that has over 10 times more vitamin C than an orange? What can you make out of it? Find out more about this mystery berry next week. It´s sweet and it´s sour, it´s soft and it´s crumbly. It´s not a lemon marengue pie but it is a ...? 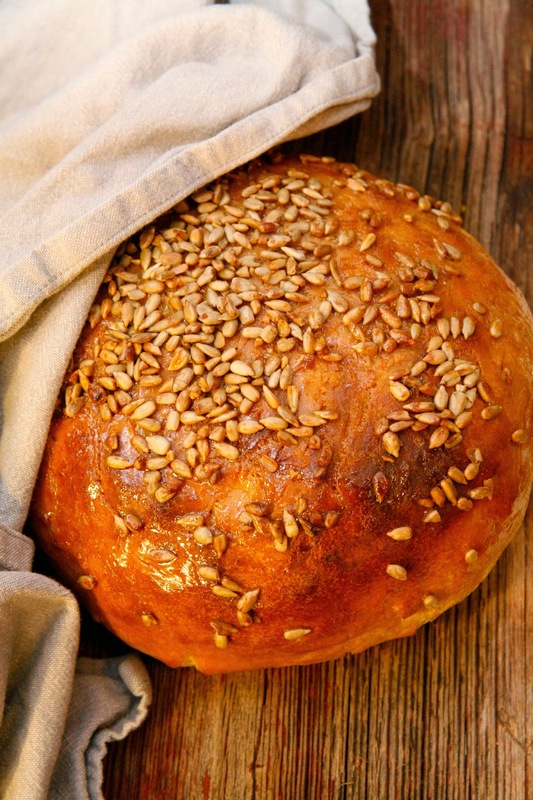 Why should you start making your own bread? Quick tips from the bread-lover.